This is our annual update to you on our efforts to end homelessness in our community. Since 2008, we have lowered chronic homelessness in our community by 25%. Since 2010, we have significantly shortened the length of stay in both emergency shelters and in transitional housing. On any given day, there are 20% fewer families experiencing homelessness. Though a small organization, the Mercer Alliance makes large changes happen, because of the many relationships that we foster. Below, we introduce you to three individuals who came to the Alliance as AmeriCorps VISTAs - Volunteers in Service to America. 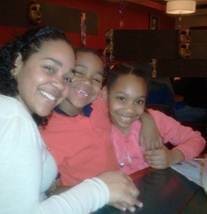 Our newest VISTA is Michelle Ellis Williams, a life-long Mercer resident, who lives in Hamilton with her husband, Eric. Michelle had a career as an Executive Assistant, but, as she’ll tell you, she began medicating her undiagnosed anxiety with street drugs. She lost her stable job and home and spent years walking the streets of Trenton and living in abandoned buildings. Michelle got clean through the program at UPI’s Trenton Treatment Center and Narcotics Anonymous and she now sponsors several individuals in recovery. When she married Eric, she got stable housing through Greater Trenton Behavioral Health Care’s Housing First Program. She is going to school for Graphic and Web Design. Michelle’s work with the Alliance is focused on volunteer recruitment for our major projects built around volunteer effort, The Mercer CASH Campaign (Creating Assets, Savings and Hope) and the twice yearly, Project Homeless Connect. Last year Alliance-trained volunteers completed over 1,100 free tax returns for Mercer County residents. These households received earned income credits of 1.5 MILLION DOLLARS. For most of them, with average incomes of $22,000, these funds make up the gap between the high cost of living in Mercer County ($1,200 monthly for a two-bedroom apartment) and their limited earnings. These funds also contribute to local economic development. Our goal for this year is 1,400 returns; Michelle’s work in volunteer recruitment is key to helping us reach this goal. Our second story is of Jennifer Rosado. At 21, Jennifer was a single mom with two kids, who became homeless when she left her mother’s house. During the nine months that she was homeless, she was helped by HomeFront’s emergency shelter and transitional housing program, before she created the new home that she knew her children needed. She brought her office-related skills to the Mercer Alliance as a VISTA in October, 2007, becoming a regular employee three years later. Jennifer’s VISTA years saw the doubling of the Alliance’s capacity to do free tax returns. She was instrumental in the transition from paper to e-filing of returns, now 98% of the total returns, and in supporting organizations to become IRS-approved volunteer tax sites. Her bilingualism has been a valuable asset in spreading awareness of EITC in the Latino community. In addition to her full-time work, Jennifer is a student at Rider University, soon to receive her Associate’s Degree. Finally, and sadly, we want to remember Scott Fairman, who passed away in October at the age of 53. Despite his Bachelor’s and Master’s degree, Scott hit bottom in his life and became homeless. Helped into recovery by Catholic Charities’ program for the dually diagnosed, Partners in Recovery, Scott committed himself to become a helper to the homeless, paying forward the help he had received. He spent three years as a VISTA at the Mercer Alliance. 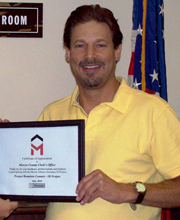 Scott is best known for his work in creating the Mercer Alliance’s Homeless ID Project. Leading focus groups for homeless individuals, Scott discovered the many barriers people experienced whose means of self- identification had been lost or stolen. Without ID, individuals could not easily enter some of the very buildings where they needed to access services and benefits. Scott developed relationships with the key government partners in Trenton, the Board of Elections, the Mercer County Clerk’s office, and with the assistance of community volunteers and agency staff, he led the ID effort at Project Homeless Connect, which brought free County IDs to 200 individuals. We have chosen to honor Scott by naming in his memory the Scott A. Fairman Homeless ID project. We have told these stories of profound hope – of what individuals can achieve when they are given the opportunity to turn their lives around. The Mercer Alliance fosters many such miracles every day. We will keep at it until we have all the systems in place for helping rapidly exit from homelessness to regain self-sufficiency. Please do everything you can to support our work by donating, volunteering and advocating along with us. Support the Mercer CASH (Creating Assets, Savings and Hope) Campaign to assist families and individuals to receive the earned income tax credit and refund they are entitled to at the FREE Tax VITA sites. Taxes are completed for individuals or families making less than $50,000. Support the ID Project, which helps a homeless person get identification necessary for receiving benefits and housing. It is named in honor of its initiator, Scott A. Fairman. Support the bi-annual Project Homeless Connect, to help people experiencing homelessness get connected to vital services, necessary supplies, clothing, and receive a free hair cut and an free extra meal.